The business world is changing every day and you need be able to adapt. Pick up your smart phone and you’ll see daily examples of businesses that have failed to evolve or keep up with the times and are being left behind as a result. If I had known how the world was going to change, I’d be a rich man, but instead I’ve developed a few key tactics to help me predict and manage change. Surround yourself with different people – this will instantly provide you with different perspectives of the world. Actively read about your industry –be “in the know” about what is happening with your partners and your competitors. Read their business results, look at their websites, and sometimes just surf social media sites like LinkedIn. Make this a daily habit. Ask a lot of questions – this usually leads to better solutions, and also helps to engage the right people that you need to drive change throughout your organization. “What do you need to make this successful?” and “How could we do this better?” are my usual go-tos. Face fear – people usually don’t like change for fear that it will somehow negatively impact their lives. I encourage you to take the time to look at this from their perspective. Are their fears justified? Can we do something to address these concerns? Communicate, communicate communicate – you can always do this better. We all can. 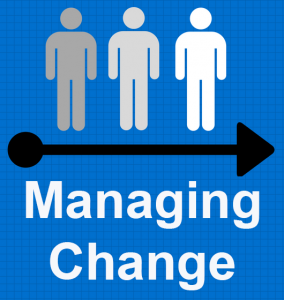 Take the time to address change with each of your team members. Sometimes a 5 minute conversation can address a lot of concerns and improve moral. I personally dislike the “if you don’t hear from me, everything is okay” approach. This is lazy and shows a blind spot in your ability as a leader. Be adaptable – plan and have a backup plan just in case. Change is the only constant in life. Having the ability to lead during times of change is important. Your team will thank you for this.